NLADA promotes policies that advance justice for low-income communities. Creating equal justice requires effective policies in all levels of government and at varied organizations. 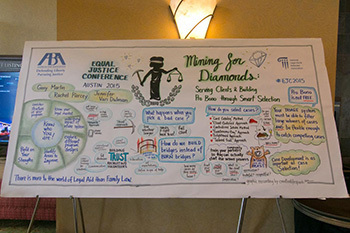 NLADA works across a wide range of issues to produce change, from advocating for increased funding for legal aid programs and public defense systems to helping organizations build leadership capacity and racial equity. Taking place in collaboration with our members and other people from communities across the country, these efforts share a common goal: producing excellence in civil legal aid and public defense programs in order to create justice and opportunity for low-income people.